After being hacked and apparently exposing customer password data in some form, Zappos has made it impossible for you to tell what password you had used on their site. Zappos just made a big mistake – their site was hacked, and information about 24 million customer accounts was stolen, including password hashes (http://www.eweek.com/c/a/Security/Zappos-Latest-Company-Hit-by-Data-Breach-581979/). 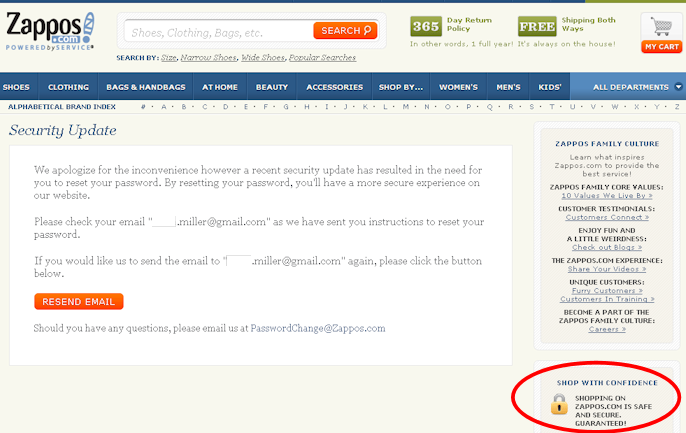 In response, Zappo has asked that its customers create new passwords for the site (http://www.zappos.com/passwordchange). Try it yourself – if you pick a likely-to-be-taken firstname.lastname@gmail.com address (I used the surname “Miller” in the attempt above), you’ll get the message, regardless of what password you use. This shows that you can’t figure out what your Zappos password used to be, and so unless you remember it, you won’t be able to change it on other sites that use the same one. What would have been better? It would have been better to force users through the password reset process using their registered email, but after allowing some way for them to verify that they had authenticated correctly with the formerly valid credentials. Measure the substance of a process by what is left over when you remove its terminology. Outside of the phase in which somebody is learning about the process/method/framework, I’m not sure there’s much to be gained from wrapping special terminology around common sense concepts. In large part, I judge the substance of a process/method/framework (not its correctness or applicability – those are different matters) in terms of what’s offered outside of the vocabulary. If I didn’t have to use your terminology (hint: I probably won’t), how much is left to learn? That’s the meat. The high-level DMAIC (Define / Measure / Analyze / Improve / Control) process of Six Sigma fame is not very meaty. It’s more like terminological shorthand for how an intelligent and methodical person would go about solving a problem in a serious way. You don’t learn it so much as recognize what the Six Sigma folks want you to call it. In contrast, the idea that I should focus on process control via standard deviations and have to measure conscientiously in order to do so – a key tenet of Six Sigma that fills out the intended implementation of DMAIC – is pretty meaty. A great document won’t breathe life into an idea, but salesmanship will. So, you wrote a document. That’s a great start, but it’s only a start. Whatever is in there – an argument, an idea, a plan, a process – may be fantastic, but it’s not going to succeed because of the document. The document was mainly for you – a way to organize your thoughts. Its mere existence will lend some credibility to whatever it is that you’re pushing, but few people are going to really read it, and next to nobody will read it more than once. Now that the document is done, it’s time to start working on your elevator pitch. For better or worse, the 60-second version of your position will have much more impact than the 60-page version. It’s time to start selling. Don’t underestimate the number of problems that can be solved by expending slightly more effort and attention than your predecessors did . This is something I hear frequently. On the face of things, it sounds reasonable – something a been-around-the-block veteran says to the starry-eyed newcomer who has yet to be introduced to reality. It puts the arrogant in their place, reminding them that they are not so much smarter / better / more motivated than those who came before them. It bespeaks practicality, and a certain worldly wisdom. Often, it is just flat wrong. Granted, one can reasonably expect that a valuable goal which has remained unattained will be attended by non-trivial obstacles. However, that is the sort of thing you bear in mind so as to temper your expectations – not the sort of thing that should slow you down in advance of locating and confronting those obstacles. The “if it were easy” refrain is more likely to be a catchphrase of complacency than a sign of sagacity. It is used as warrant for the worst kind of failure, the kind that comes from never even trying to succeed. What suggests that you can achieve a goal that has remained unrealized, in spite of many competent predecessors? Even good people tend to buy into organizational myths about how difficult things are or the reasons that such-and-such won’t work. The people before you might not have even tried to solve the problem because they were sold the same “if it were easy” notion. This dynamic becomes progressively self-reinforcing as more people come to brand a particular problem as hard, longstanding, etc. Such branding creates a kind of inertia that is difficult to overcome, and helps to explain why new faces are often able to make tremendous changes to an organization in a short amount of time – they have yet to be introduced to the contents of the “don’t bother” list. Even good people get lazy sometimes – the problem you’re looking at may be one of those areas where nobody competent has ever really rolled up their sleeves yet. Achievements are incremental – the blockers that kept your target goal from being realized in the past may have been recently removed by a new information system, org structure, business rule change, etc. You might be the first one to stand on the shoulders of the giants who came before you, and do full justice to their achievements by building upon them. Plenty of easy (or at least very manageable) things that are worth doing remain undone in every organization, and you’re not tilting at windmills just because you don’t accept the blithe alibis of those who don’t want to bother expending some uncommon effort. What’s relatively easy may very well remain undone. However, what’s already done is bound to be even easier, which is why so many people avoid the risks and uncertainties that attend meaningful progress. Your software development process should be contextual, likable, forceful, and readable, and you should get it this way by iterating over it. So, you want to define a software development process for your organization. Good luck. If it isn’t hard work, then you’re probably not doing it right, because you ought to take many factors into account, and those factors tend to be very organization-specific. Although you can gather lots of great ideas from books and process gurus, your ideal process will be so influenced by environmental factors that no text or outsider can tell you what it should be. At the end of the day, all of the tough calls will be on you. Also, since the development process will affect every project and stakeholder in your organization, it’s a high-stakes proposition, and something you probably can’t afford to screw up. What should the process cover? Actually, figuring out what kinds of things the process should govern / specify is an essential part of the process definition. (No free lunch here.) It’s not just a matter of figuring out how to answer a series of questions in an organization-specific way, which would be hard enough. You also have to figure out which questions are worth answering in the context of your organization and its goals. A larger development shop may dicker productively over the standard set of documents that will be dissected in design reviews. A one-horse development shop probably doesn’t have the same concern, as there’s nobody to do such reviews. Activities that will happen: The “coding” part is more or less a given, but are you going to do ROI analyses, design reviews, independent testing, user acceptance testing, management approvals, formal training, etc? Order in which activities will happen: Are you going to be more waterfall-ish, with code mostly following an requirements gathering and design, or are you going to be more agile-ish, and allow your code to grow up alongside your requirements and design? Conditions on activities: What circumstances require or preclude particular activities? What approvals or phase gates govern movement from one activity to another? Deliverables produced: What kinds of products do you need to create in addition to the software? Design documents? Manuals? Enforcement mechanisms: How will you ensure that the requirements of the process are being respected? Will you do process reviews? Audits? 1) Software practitioners (engineers, project managers, etc) should like the process. They don’t need to take it with them to Disney World, but they shouldn’t be bristling and gritting their teeth as they struggle under its yoke. If practitioners don’t like the process, it won’t be used as intended, and will hence be a failure. Even if a disliked process is mandatory, people will figure out ways to achieve superficial compliance, even though they are really doing things some other way. Accordingly, the process should be designed mostly by the practitioners themselves. This will presumably lead to a process that the practitioners think is valuable, and will greatly increase the likelihood of broad buy-in. Management can and should levy requirements on the process, but the practitioners should be allowed to satisfy those requirements how they see fit. 2) The process must be forceful, which is to say that it must contain mostly shalls – things people have to do (if they want to avoid a beatin’), as opposed to shoulds – things that are recommended. When a group is trying to define a process, members will often weigh in with suggestions, guidelines, and best practices that represent their views on how software engineering should be done. This may seem useful at first, but any group of experienced professionals can say a great deal about how things should be done. Before long, you’ll find yourself writing a software engineering book, filled with a big pile of shoulds that individuals will happily ignore whenever timelines get tight or when they happen to disagree with the recommendation. The payoff of this book will be too small to justify the time it takes to write it. Instead, your process should focus on what is mandatory / required, even if it is only required in certain circumstances. There is value in a big pile of shoulds, but it belongs in knowledge sharing activities (lunch and learn stuff) as opposed to a process definition. 3) The process must be extremely concise (as minimal as possible) and readable. A process that expounds on its topics in an academic and/or lengthy manner will go unread, and a process that goes unread is a process soon to be dead. 4) The process should be developed iteratively, because iteration works for everything. Don’t wait until you have the whole thing nailed down before you deliver something. Rather, start piloting elements of the nascent process as soon as possible, so that you can gain some real-world experience and adjust accordingly. Particularly if your process levies new requirements on people, you’ll want to see where people are tempted to cut corners, and if they still agree in the heat of battle to the same things they agreed to on the whiteboard. If the process you develop is sensitive to its context, respected by the people who will use it, slanted toward mandatory practices, and right to the point, it will likely be a success. Further, you are more likely to define such a process by iterating over it early and often. Everybody knows the benefits of iteration for developing software, but iteration should be practiced for developing just about everything. If you’re working in software development, professional literacy / competence demands some acquaintace with iterative development techniques. From intern to architect, it has been drilled into us all – iterate, iterate, iterate. Most of us can and do carry the tune – we deride the linear ways of waterfall (at least explicitly), and preach the gospel of iteration. People often don’t know what they want – It takes seeing some kind of semi-realistic product before people realize what they do and don’t want from a system. Iterative development gives people slices of functionality that they can test-drive, thereby enabling the feedback needed for future iterations. People often miscommunicate – Even when they know what they want, people aren’t always so good at expressing it. Further, even if well-expressed, a requirement might be easily misunderstood. Iteration allows people to look at something in progress and say very simply and specifically what is right or wrong about it. Requirements change – Targets have a way of moving, even the ones that have already been hit. Iteration gives you a way to continually re-validate requirements and to keep pace with fluid demands. So, we all know the above, and countenance these truths in our development practices. Yet, for some odd reason, most of us reserve the valuable practice of iteration for creating code. When we need to produce user guides, proposals, standards, COTS evaluations, slide decks, and any other non-software deliverables, we revert to the dark ages of engineering, hoarding our labors and polishing them at length, waiting for the right moment at which to unleash them upon the world. Your non-software deliverables are just as susceptible to miscommunication, moving targets, and imperfect requirements as your code is. As such, you should iterate over those as well. Don’t wait until you have a complete and thorough document / presentation / proposal before throwing your cards on the table. Instead, get something (e.g., a table of contents, outline, or synopsis) out to other stakeholders as soon as you can, and let the magic of iteration help you to make these products as good as they can be.